Here’s a simple guide for installing Docker on CentOS 7.x – Install Docker on CentOS 7.x. The step is optional as it is presumed you already have a Django project, ready to deploy. If so, jump to next step and arrange your project directory accordingly. 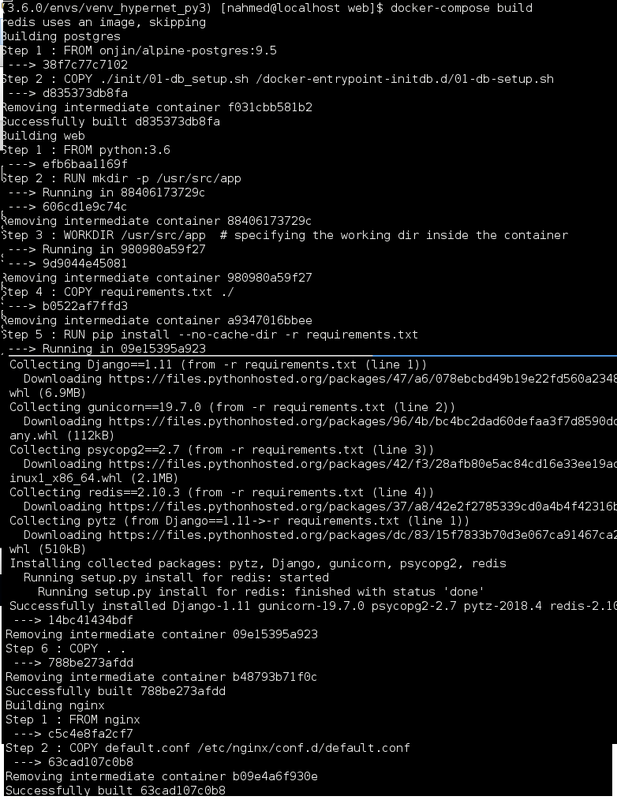 To build a docker container all what is required is creating a Dockerfile. Here we’ll be specifying a Dockerfile for each of the component, so we can have them as a separate service i.e. container – instead can also use ready-to-use container images. postgres/ – has the Dockerfile, and init scripts (create DB, role) and SQL (table creation). web/ – is the main folder containing the Django project i.e. place your project under web/ directory. Note: Move the django project one level up i.e. manage.py must be at web/ root. version – the docker compose version to use. services – This section will have all the services/containers configurations. volumes – The volumes we need to create on the docker host machine (running docker compose). Use-case, is to map container’s directories for which we need to persist data i.e. data surviving the container’s life-cycle. build – is to specify where the Dockerfile is located for the service i.e. docker needs to build this service image. image – is an alternate for using ‘build’ i.e. we’ll be using a read-to-use image for Redis. restart – this container will always be up i.e. it’ll restart on crash(es). expose – is to state the container port we need to expose to other services, so they can communicate. depends_on – to specify a start order i.e. web depends_on redis and postgres, so web will only be started once redis and postgres will be up. 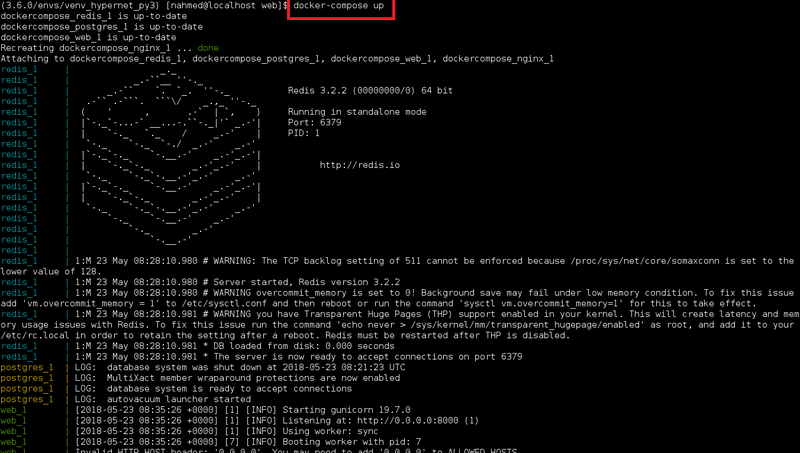 volumes – maps the docker volume (specified under volumes section) to a container’s directory i.e. we persist our postgres data, we have mapped the /var/lib/postgresl/data to pgdata volume. Note: Due to formatting the following docker-compose.yml may have lost it indentation (very important for YAML) – you can fine the exact file used during the tutorial on Github, along with all other files. The following docker compose command will build the container image for all the specified services in docker-compose.yml i.e. web, postgres, redis, nginx. This is a Django specific step (nothing to do with docker compose). For a new Dango deployment it is required to create the database migrations i.e. the database tables. Note: It’ll start the postgres and redis containers as web service depends on them. Now we have everything setup and ready to start. The following command will start the services (already built at step 4), each as a separate docker container. As we have defined four services – web, nginx, postgres, and redis. the postgres service is built using the Dockerfile, which is using the official PostgreSQL image from Docker Hub, which installs Postgres and runs the server on the default port 5432. Copied the init scripts (creating roles and database) into container’s ‘docker-entrypoint-initdb.d/‘, all the scripts in the directory will get executed as part of container init. Finally a volume is specified to ensure that the data persists even if the Postgres container is deleted. The redis service uses the official Redis image ‘alpine-redis:3.2.2’ to install Redis, and port 6379 (default) will be exposed to other services. Next, the web service is built via the instructions in the Dockerfile within the “web” directory – where the Python environment is setup, requirements are installed, and the Django application is fired up on port 8000 using gunicorn. As you can see nginx container has it’s 80 mapped to port 8000 of the docker host (machine on which we’re running docker-compose). Simply hit the localhost i.e. http://localhost:8000 and you’ll have the Django homepage appear. Use volumes – to persist data out of container’s lifetime. Use of docker exec command is preferred over using SSH to get into a container. Avoid manual changes inside a container – keep it in the docker-compose.yml or Dockerfile, for the sake of consistency.